The blending and bottling of Pusser’s Navy Rum takes place in a small plant on the Island of Tortola in the British Virgin Islands where operations are overseen by the brand’s founder Charles Tobias. Black Tot Day could have been the end of the true navy rum if it weren’t for Charles Tobias. A Canadian by birth, Charles served in the US Marine Core in Vietnam where he had witnessed fellow comrades being shot out the skies because their on-board missile tracking systems were not quick enough. After leaving the army he set about persuading the powers that be to give him a grant to develop computer components that could save lives and help win wars. If you have ever met Charles it will not come as much of a surprise that they said yes and as a result he made his fortune in Silicon Valley. After selling his company Charles was free to pursue his love of sailing, with a crew, a rather impressive yacht, a BBC film crew and a pet chimpanzee – but that’s another story. One day while out sailing he happened upon a British frigate and was invited to come aboard. The Captain offered Charles a toast of some of his remaining stocks of navy rum. The quality of the rum made a lasting impression on Charles and being an entrepreneur it gave him an idea. Charles then approached the British Admiralty and asked for the rights and recipe to reproduce navy rum. The Royal Navy is the oldest, continuously operating military organization in the world with a charter dating back to 1585 and the time of Henry VIII. It is not given to commercialism so unsurprisingly they said no. However, Charles being Charles, he did not take no for an answer and in 1979 he flew to London with Major General Arthur B. Hanson U.S.M.C., a good friend from his Army and Navy Club. The two went to the Admiralty where Admiral Sir Gordon Tate, Second Sea Lord, persuaded his British counterparts to grant Charles the right to use the name ‘British Navy Pusser's Rum’ with the royal ensign on the label. Remarkably they even went so far as to issue him with all the blending information and samples to match his blend against. Never before had the Admiralty’s blend of navy rum been made commercially available and Charles had to create a brand identity, bottle and labelling for his rum. 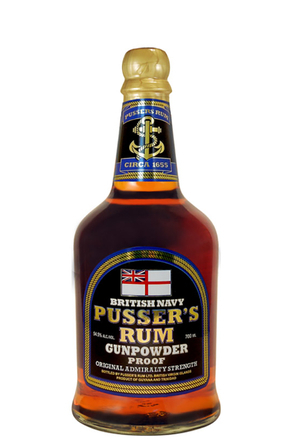 The name Pusser’s Rum had long been used by British sailors as a slang term for Royal Navy rum and is a corruption of ‘Purser’ (provisions officer), the ship’s officer charged with issuing the daily rum tot. The bottle design was less obvious as previously the rum had been stored on-board ship in imperial gallon (4.54 litre) handmade ceramic demijohns encased in hand-woven wicker baskets. Charles enlisted the expertise of ED & F Man of London who had been the Admiralty’s rum brokers from 1798 to 1970 to help source the rums he needed to exactly replicate the admiralty’s original blend. He sort to use rums still being made in the original, formally Admiralty owned stills, the single most important being a unique pot-still rum from Demerara Distillers in Guyana who still work two original wooden pot stills. These stills have copper tops and bottoms with oak staves forming their sides. Operational for more than 200 years these are the two last remaining wooden pot stills in the world and although staves have gradually been replaced over the centuries, the distillation of rum in these stills imparts a truly unique flavour. 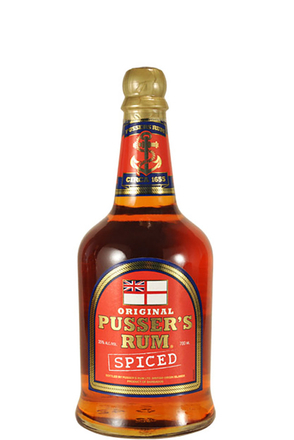 Charles not only wanted to mirror the original blend of Royal Navy rum, he also wanted Pusser’s to be the original ‘navy strength’ of 54.5% alcohol by volume. Having acquired the rums he needed to recreate the Royal Navy’s blend he needed somewhere to do the blending and bottling so Charles constructed a small plant on the Island of Tortola in the British Virgin Islands. The first bottle of British Navy Pusser’s Rum was bottled here in November 1979 making it possible once again to have a tot of genuine British navy rum. When Charles, acquired the rights to Pusser's from the Admiralty, he volunteered an on-going royalty donation of $2 from each case of Pusser's Rum to the Tot Fund. He made the first payment in 1980 when he presented a cheque for £10,000 to Admiral Tait, Second Sea Lord. As the Pusser's Rum grew so Charles was persuaded that a larger company would be better placed to grow the brand and so increase donations to the Tot Fund. 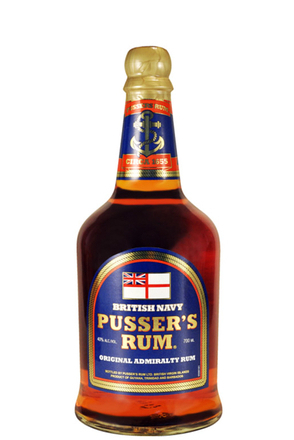 So in 1990 Pusser’s was sold to the Jim Beam organisation. Charles remained close to the rum and it quickly became clear that a niche brand such as Pusser’s was lost in the huge corporation so in 1999 he bought his beloved rum back. Charles continues to make Pusser’s according to the Navy’s original blend without the addition of flavouring agents or sweeteners found in many lesser rums – merely adding a hint of caramel to ensure colour consistency. After an employee used a blow touch a little too close to the rum stocks the bottling plant when up in flames so blending and bottling of Pusser’s was moved to Barbados. However, both Charles and Pusser’s limited remain based on Tortola. To quote the Royal Navy's own website (royalnavy.mod.uk) "The company [Pusser’s Limited] is based on the island of Tortola, where Charles has his main residence and has been a generous host to visiting RN ships over the years." Charles also welcomes many a yachtsman at Tortola and at the nearby island of Marina Cay. Since presenting that first donation to the Tot Fund in 1980 Charles has presented many more cheques and over the years donations from Pusser’s Rum have amounted to over £1 million. The Pusser's contribution has become the Tot Fund’s largest source of income. Flavoured with a blend of locally sourced Caribbean spices steeped in Caribbean rum. The same original blend of rums according to the Admiralty specifications as Pusser's original 54.5% alc./vol. but watered back to a land lover’s strength.